De Zwarte Zee (The Black Sea) is a cosy little Lunch Café on the Graslei, the medieval port of Ghent, right in the historical center of Ghent. 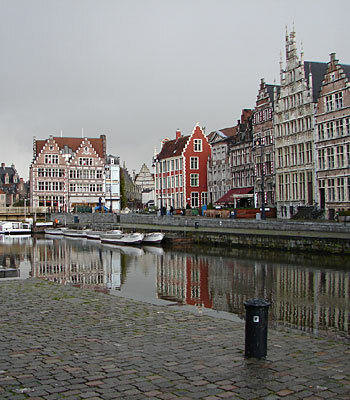 It's an ideal point of departure to explore Ghent because all major historical buildings are situated within walking distance from De Zwarte Zee. 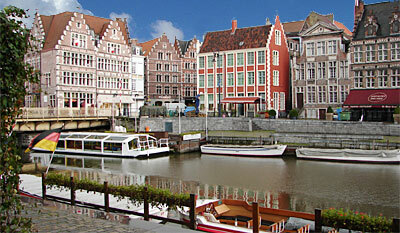 Visiting Ghent on the water, over the many waterways lets you discover the city from a different angle, not only a very attractive idea but easy to do because the boarding site of the touristic boat excursions is located right in front of De Zwarte Zee. Sitting on the terrace you can enjoy the sight of a unique surrounding, more then once the dreamed location in innumerable movies and TV-series as "Flikken" and "Louis-Louise". 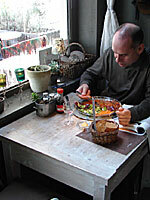 If after visiting the city you are a bit hungry, you can have a lunch in De Zwarte Zee. Several surprising and delicious plates are waiting for you. You could also pass by for a drink, reading a book chosen out of the interesting rack of books. De Zwarte Zee is the right choice.